Usefulness of unit path preview? I'm messing around with a potential new feature for ScmDraft: real time preview of the paths units would take on a map from A to B. I was wondering whether this would be considered useful for anything other than me just having fun. I could see it being used to verify wall-ins, but this is an overkill solution to that problem. It may also locate some degenerate pathing cases. But it will still be a lot of work to get fully functional, even with a ton of the groundwork being done thanks to TSCMoo letting me base my implementation on the OpenBW one. 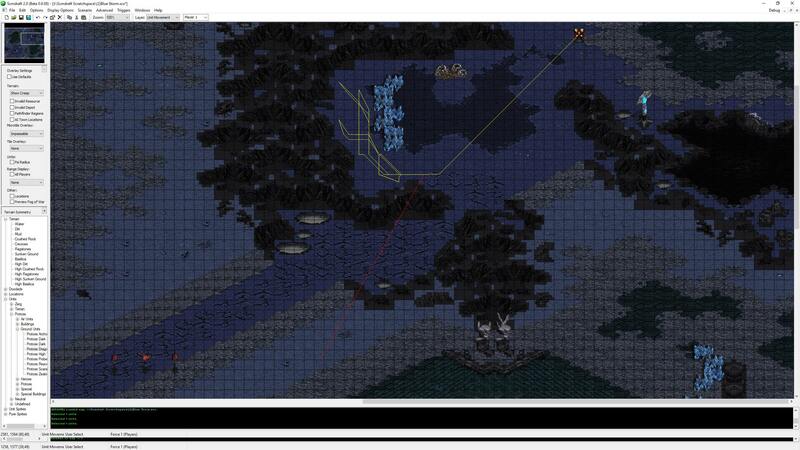 This is what it looks like now, it displays the path the selected units would take to the point under the cursor, and is continuously updated as the cursor moves. They don't appear to take the shortest straight line path, but I believe the results accurately match what the game does. The extra sidetrip appears to match what SC does from in-game testing. I guess the marine likes to go sightseeing. E: No idea why the images work when previewing the post, but do not work when viewing the final one, just click em, they work. You can upload images directly to TL via imgur, or go on imgur yourself. You probably have image linking disabled on the site? As far as utility, I'm not sure how much benefit there would be to players in general since if you wall, you want to wall tight usually, so it doesn't matter where the enemy is coming from. Also, I think players tend to send multiple commands at least in the early game which in theory would change the path trajectory? Interesting anyway. Hi S.I., great to hear that you are still working on it. 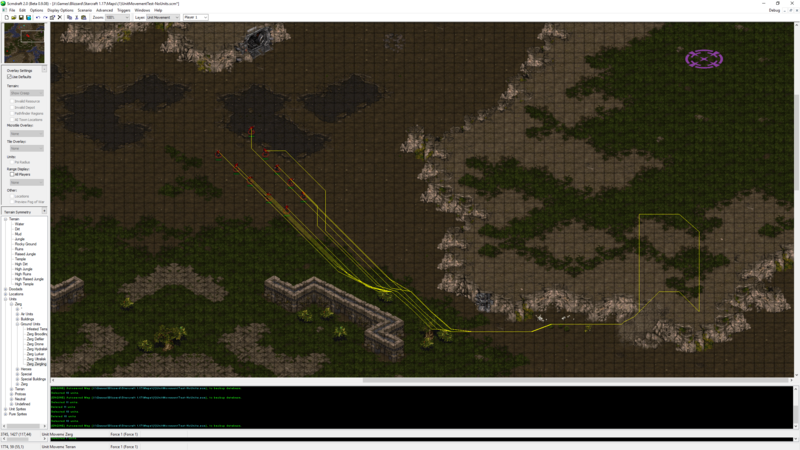 evaluate how static obstacles (like neutral buildings or mineral walls) affect pathfinding around the map. 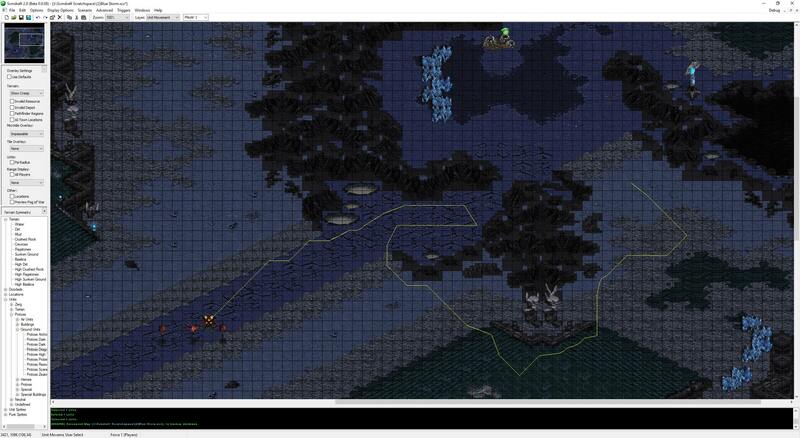 From your description I guess this will just progressively simulate the pathfinding, taking into account the terrain pathfinding regions and static obstacles (pre-placed units or unit sprites)? Ideally this would work without the need to place actual units though (or cleanup work would be required every time afterwards). But I guess due to differences in bounding boxes unit type is actually important, so maybe you can use "virtual units" (that are not saved in the map file). Air unit pathing is of course pretty trivial, but having a range/duration display would still be good (e.g. for measuring Overlord scouting distances). Another important related feature would be to have a proper range display for Reavers to better detect Reaver jam locations. Having a complete debugging algorithm that automatically classifies all pairs of tiles within a range of 8 by their real distance to pathfinding heuritic distance quotient would be ideal, of course, but just having it for one tile at a time would already be very helpful. 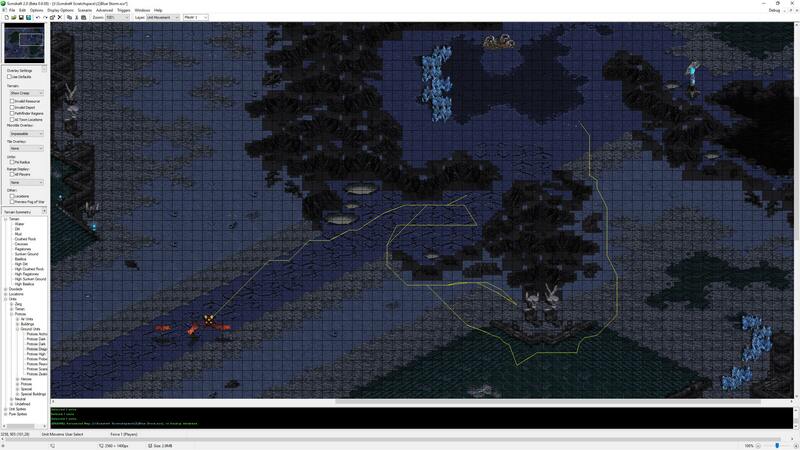 I probably forgot as many uses for advanced pathfinding analyzing tools as I mentioned, so yes, everything in that direction would be very useful and welcome tools, maybe the most important new feature that could be added to ScmDraft at this point (pathfinding regions alone have already been completely ground-breaking), given how much of melee map making revolves around pathfinding optimizations (and how little fun doing that part of it actually is, compared to doing deco ). So, yeah, go ahead. Please. Already looks promising. Yeah, this could actually be game-changing if players knew the exact amount of time it takes for a particular unit to travel a certain distance. I'm 100% for you to continue doing this. I can't think of the full breadth of utility of this but I would be interested to see what you and other people more knowledgeable than me will find. If I get that tool that would like a natural check list for me before playing any important match on a particular map to select the right build. This would be very neat and useful! 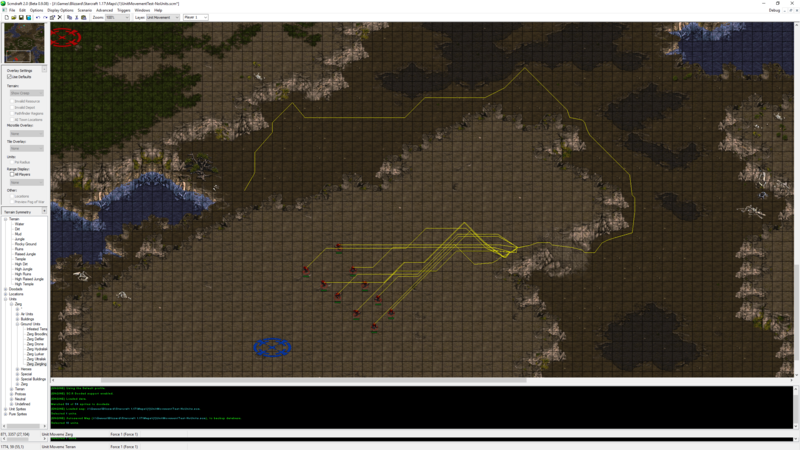 It'll be really nice to verify some of the intricacies of BW's path finding algorithm. Btw, the images wouldn't load because TL was trying to load them through HTTPS, and the SSL certificate of that server has expired (or has never existed). I rehosted your images on imgur so they show up, hope that's ok. This is amazing for mappers tho! I suspect I'd actually like pre-defined end points better than having my mouse permanently bound to it. Some defined pre-settins (like SL to SL paths) would be helpful too. I am curious what main to main Dragoon paths on Blue Storm or Arkanoid look like with the current level of implementation. Could you maybe post some screenshots? That's actually a great point, I want to see if there is some sort of stable pattern that the Dragoon starts following, how it gets to said pattern, etc. Heat map? 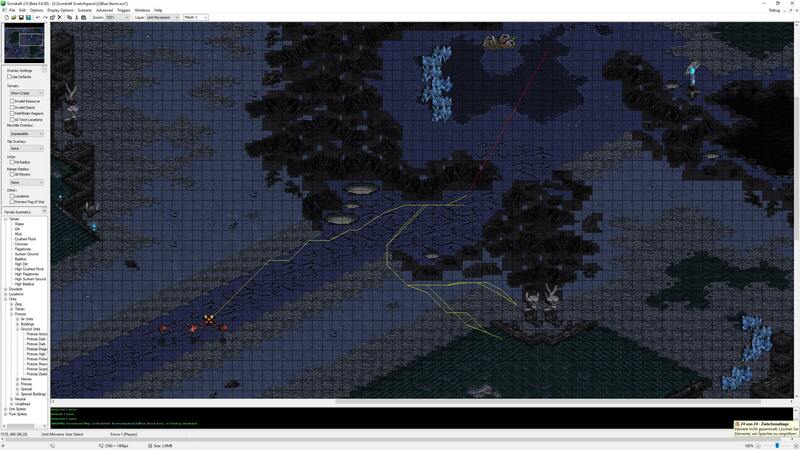 You should have seen him when I first added the pathfinding region display. I hope this just doesn't end up adding too much overanalysis of maps to the game. Basically the pathfinder finds a rough path (long path) which goes through the cliff gap, and when calculating the exact pixel based path (aka short path) it gets stuck because the dragoon doesn't fit through the gap, and the pathfinder resources are restricted in such a way that it doesn't find the long long way around over the main ramps. Oh and here is the other main. Behaves the same way. I haven't tried it in-game yet, so I do not know how accurate it is, but I expect it to be identical, except the real pathfinder may give up earlier. The red line is connection between the end of the path and where it is supposed to go. Interesting that it givers up at some point. Probably after walking through the same cycles a few (lots and lots of?) times? Sometimes units seem to wander around "aimlessly" virtually forever, sometimes they don't. I thought the only case where they would default back to stop command to be when they are actually completely blocked by other units in close vicinity (annoyingly this tends to happen when moving a tightly packed army consisting of multiple control groups as well). Your pathfinder is accurate, though, jusdging by in-game behaviour – with one exception: Yours does not take unit collision (in this case with minerals) into consideration, but I guess I don't need to tell you Anyway, can you also make a screenshot with the paths a Goon would take from the very centre of the map to either SL? Are you able to compute the time required to travel the path after having found the path? That would be very interesting and useful. Obviously just a matter of calculating path length / unit speed. Yep … units are now taken into account, but it doesn't have a nice fast lookup for nearby units, it has to loop over all units on the map all the time which is time consuming. Again, just a proof of concept. It's still missing unit speed, acceleration, etc, but at some point yes. Yep, that's very similar to what I have observed in-game. What if dragoons communicate by dancing across the map and you just cracked the code? 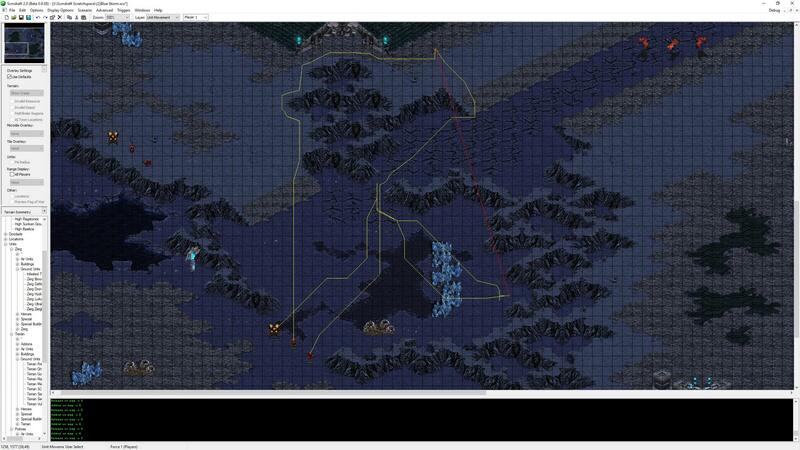 If I increase the resource limits significantly, the dragoon will (almost) always find a path, but ends up still taking the detour. 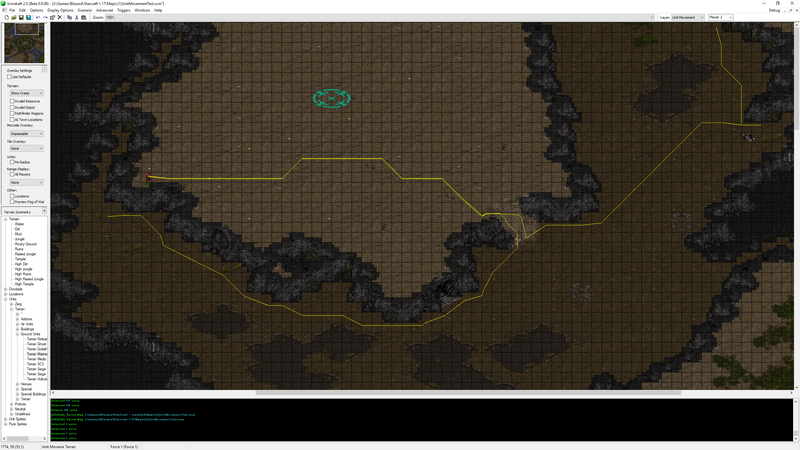 The detour can probably be avoided if the detailed path is calculated with a larger long path look ahead jump, but both of these end up using a significant amount of additional CPU time so I can understand why the pathfinder was tuned the way it is.